WAKAO Toshisada | Gray Shino Round Plate Half Moon — Dai Ichi Arts, Ltd. Here, a sensitive different shades of grey Shino glaze provides the ground for a beautiful progression of flora. Like a Rimpa school scroll, this plate displays season: Suzuki grass and bellflowers for autumn. 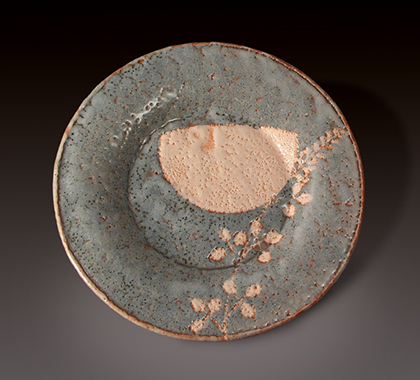 The round form and mix of shiny and matte surfaces enhance the delicate beauty of the plate. Wakao's supreme artistry is certainly on display here-he has elevated the Shino style to a higher plane, and created a beautiful plate.